It doesn't seem like much, does it? Just two minutes. Two tiny minutes to stand there and let you brush their teeth. But, alas, the brushing routine rarely goes off without a hitch. Don't get discouraged. You should be proud of yourself as a parent. And one day, your kids will (hopefully) thank you. In the meantime, here are 6 ways you can use to convince your kids to stand still for the dreaded 2 minutes of brushing. 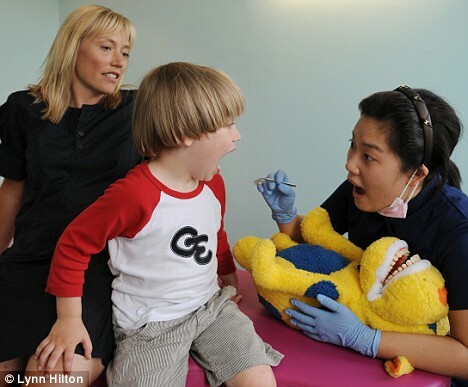 Let your child brush their doll's teeth or their stuffed animal's teeth, and then practice brushing on them. Brush all over their body – their arm, their ear (with a different toothbrush than they actually use) and ask, "Is this where I should brush?" Children love to play and, in fact, they learn best by playing, doing, and experiencing. Not only will you teach them the proper way to brush, they'll see it as just another game to play, and they'll look forward to it at bedtime! Or any other animal for that matter. Many moms have their child make animal sounds so that they open their mouths wide and mom can reach all the way to the back teeth. You can also designate specific sounds for where you're brushing (think routine again), such as "teeee" for the front teeth" and "ahhhh" for the back teeth. Kids love to feel grown-up. Take them to the store and let them choose their own toothbrush. Make a big deal about them buying their own "special" toothbrush that only she gets to use. This will help to reinforce the idea that grown-ups brush their teeth, and they'll want to do so also to feel grown-up. Get rid of the froggies or the sugar bugs. Jennie Garth tells her kids that there's a froggy in their teeth that they've got to get out. When they spit out the toothpaste, she drops a plastic frog into the sink. This game amused her kids so much that they'd let her brush their teeth for as long as it took. Many moms also brush away the "sugar bugs." Either way, it creates a fun game that engages kids. Need a helping hand? We're here for you! Our Lil StarSmilez are perfect for demonstrating and encouraging little brushers. Check them out!